The rave7™ Event Manager allows you to schedule calendar events and post them to our website. User can view and register for these events if required. They can also pay for events you wish to charge for. But this is just where it starts. The Event Manager has an advanced recurrence manager that allows specify how the event should re-occur, and in addition, you can make granular changes to the computer generated event schedule. You can assign leaders/teachers to your events and provide email notifications as they are scheduled to lead an event, course or class. 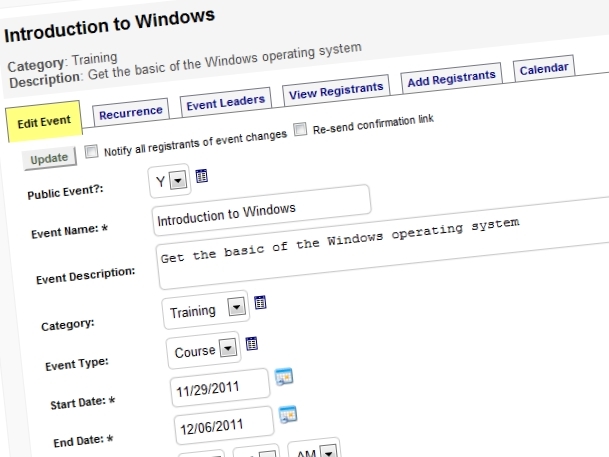 Users can be scheduled into events internally and list/calendar views are available. You can manage users on waiting lists and advanced conflict resolution by date, time, location, room is also provided.